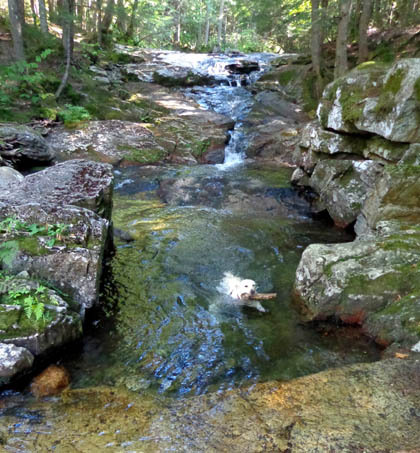 This entry includes photos from seven different places in the White Mountains where I took photos on hikes, usually with Casey and/or Cody, our fun-loving Labrador retrievers. Sometimes Jim hiked with me. Other times I hiked somewhere along his cycling routes after dropping him off at the beginning of a bike ride or picking him up at the end. 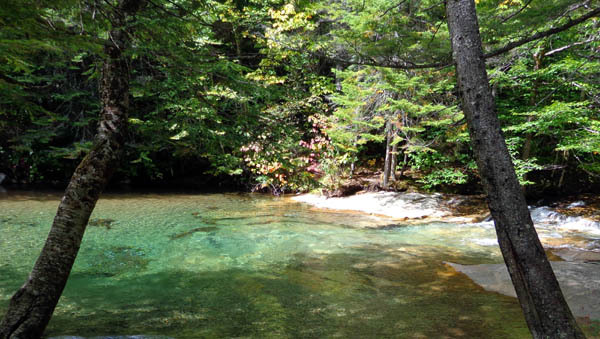 All of these are popular places for visitors to hike in the northern Whites. 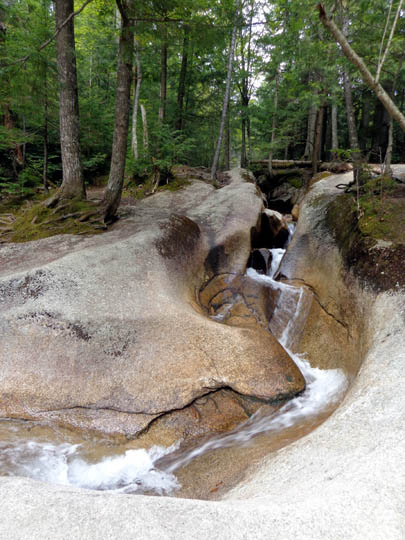 Most were new to us; the only one of the bunch that we've visited previously is The Basin. 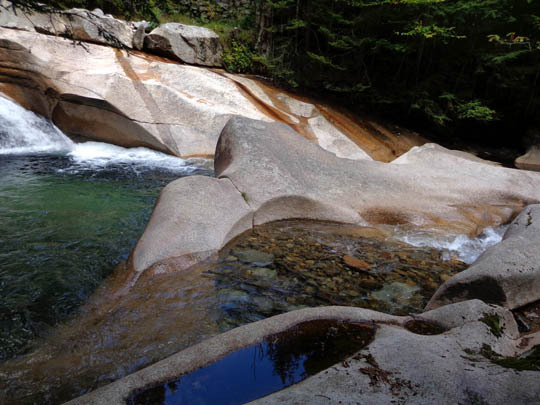 Since I mentioned it in the previous entry, I'll begin with this stream full of waterfalls, cascades, pools, and colorful rocks. It is located on the north side of Mt. 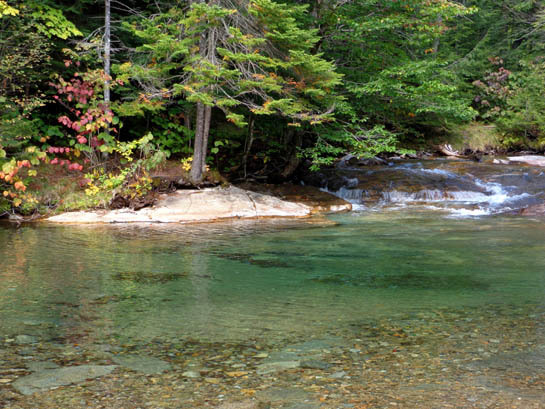 Adams in the northern Presidential Range. I enjoyed the creek so much on my Mt. Madison hike that I took Cody and Casey back to it twice so they could play in the pools of water. Jim also accompanied me on one of those hikes, a round trip of a little over a mile from the Appalachia parking area on US 2. 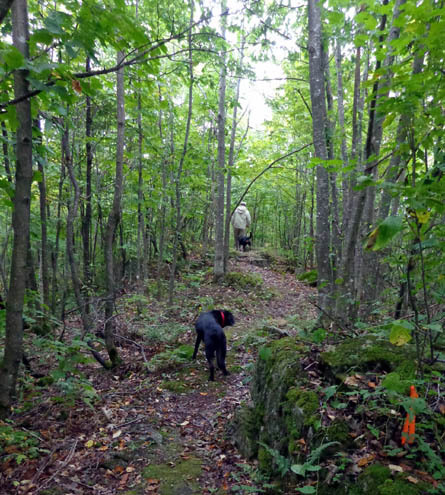 Cody leads the way on the Maple Walk Trail. 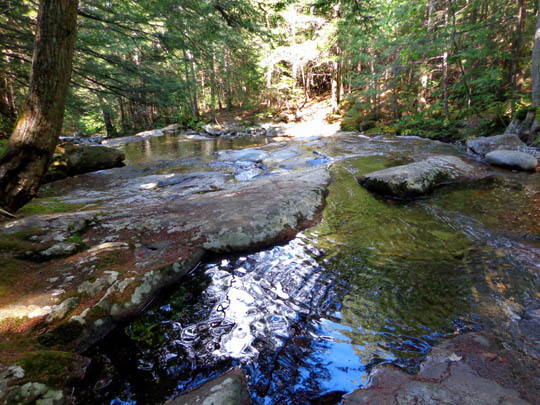 Above and below: This inviting pool of water is near the intersection of Maple Walk and Falls Way. 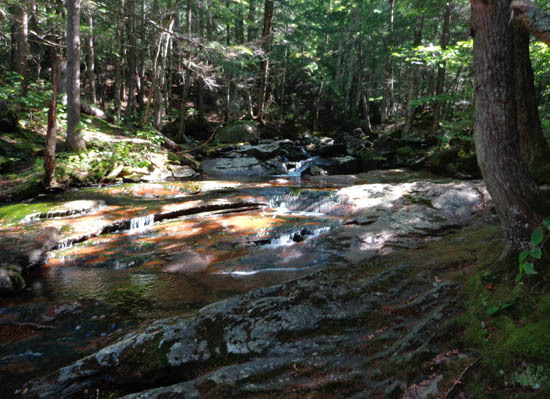 The quickest way to access the creek is to follow Valley Way Trail to Maple Walk, go left, and follow the trail to Snyder Brook. There is also a trail on the other side of the creek. 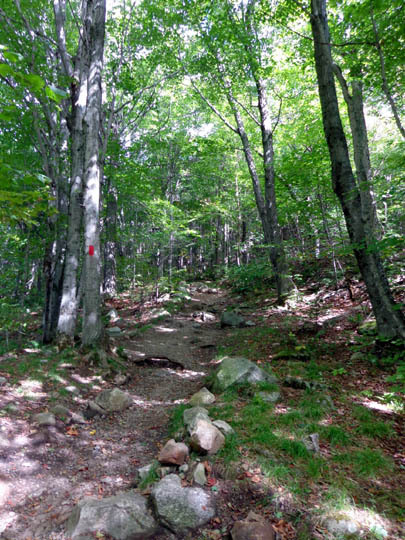 The paths to and along Snyder Brook are relatively easy to hike and great for kids, dogs, and people who aren't able (or don't want) to hike gnarly or steep trails. 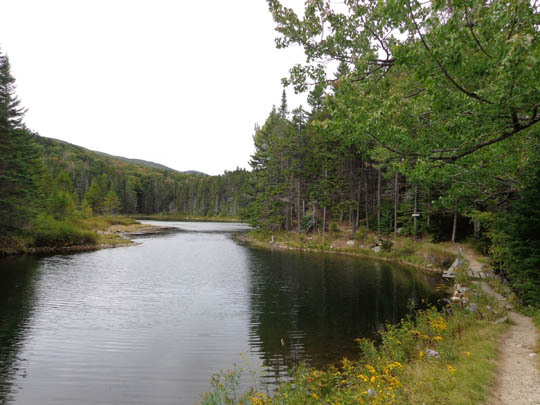 This pretty little lake is off US 302 near the AMC's Highland Center at the northern end of Crawford Notch. 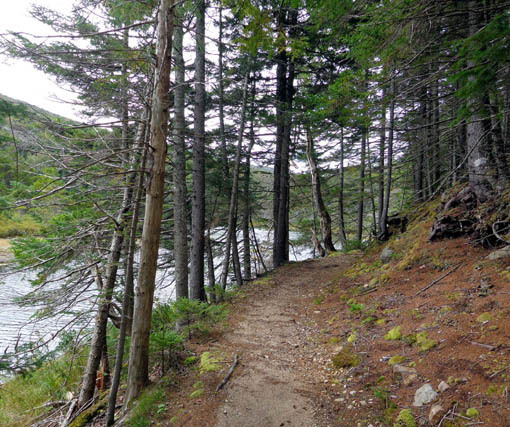 Several trails go out from the Highland Center, including the two-mile loop around Ammonoosuc Lake. I hiked around the lake with the dogs last Friday morning while Jim was riding his bike from Twin Mountain RV Park to the town of Glen. He rode past the Highland Center during his ride. It was also the day the running relay was proceeding through the Notch. One of the transition points for the runners was the Highland Center, so the parking area and roadsides were packed with crew vehicles. I managed to find a spot to park at the far side of the building not far from the trail head. 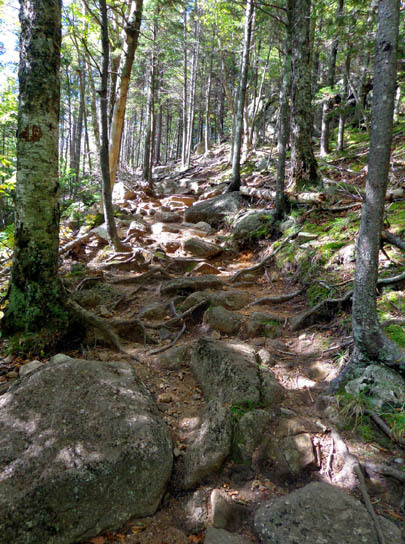 The trail is fairly flat and fairly easy to hike except for some roots and rocks here and there. The dogs enjoyed swimming in the lake. We didn't see anyone else on the trail while we were hiking. 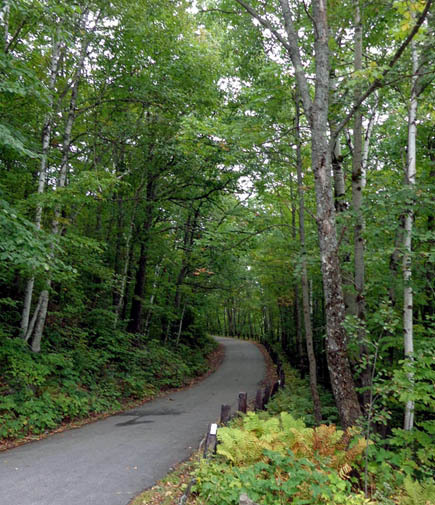 If you continue driving a little farther south on US 302 to Crawford Notch State Park you'll come to the Ethan Pond parking area. 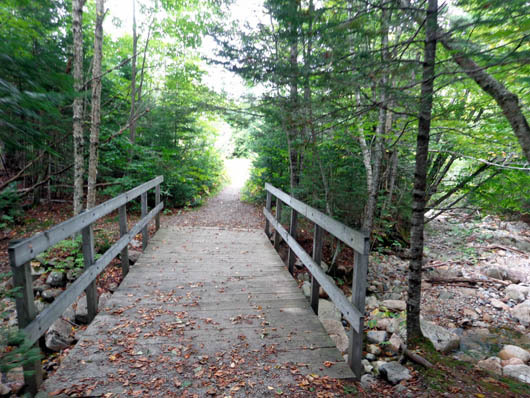 Follow the Ethan Pond Trail west, over the railroad tracks, for 3/10ths mile to the intersection with the Ripley Falls Trail. The falls are another 4/10ths mile, approximately. 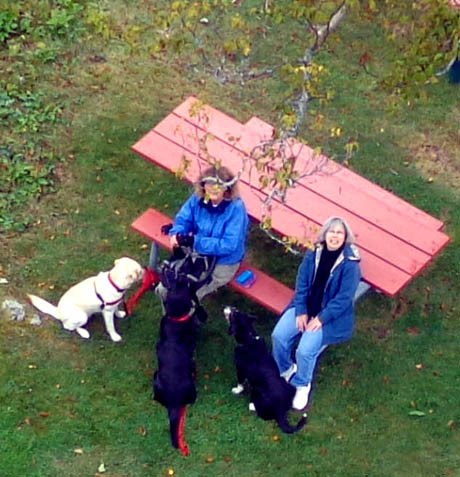 I talked Jim into going with the dogs and me on this hike Tuesday afternoon between rain showers. I thought it would be an easier hike than it was. 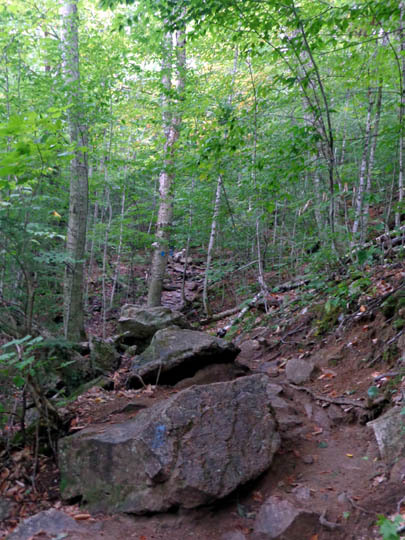 If I'd realized how steep and gnarly the trail is, I never would have suggested Jim go with me. He hated this trail and the waterfall was a disappointment to both of us because there was so little water. 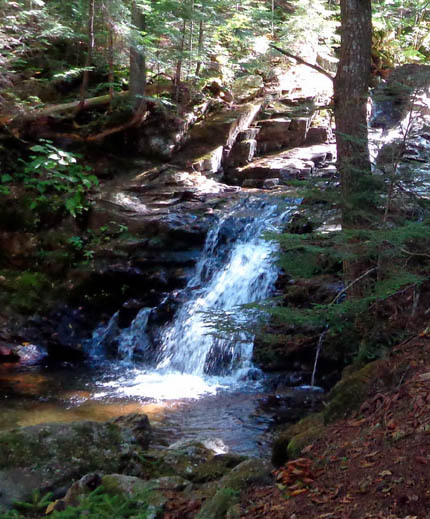 Pictures of the falls are much more attractive when there is more water -- and a blue sky. I suppose I could have called this another A.T. Redux entry. On the way back down to the parking area we both realized we'd been on the Ethan Pond Trail nine years ago on our A.T. Adventure Run-Hike! 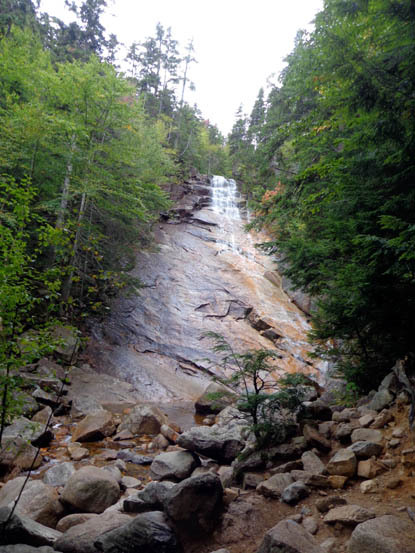 I was just finishing up the segment that included Franconia Ridge, Galehead Hut, and Zealand Falls, and Jim and Cody hiked up to meet me a few miles from the end. <sigh> We were both in better shape then and our knees hadn't crapped out on us yet so the trail didn't beat us up as much as it did this time. 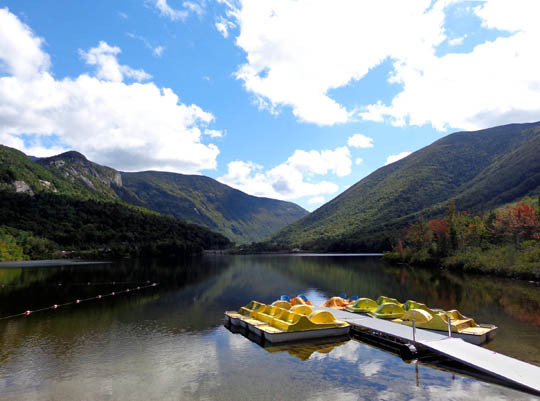 Now I'll show you three places in Franconia Notch State Park that are popular with visitors and residents. 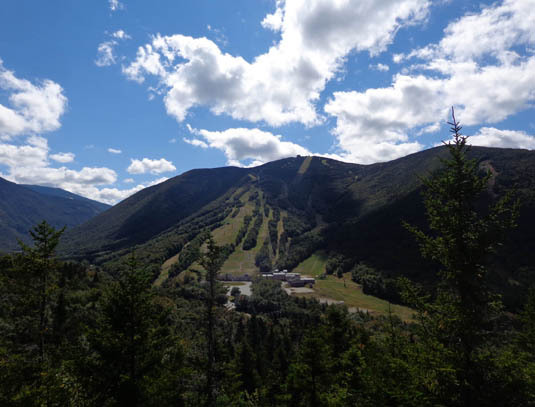 Ski slopes on Cannon Mtn. 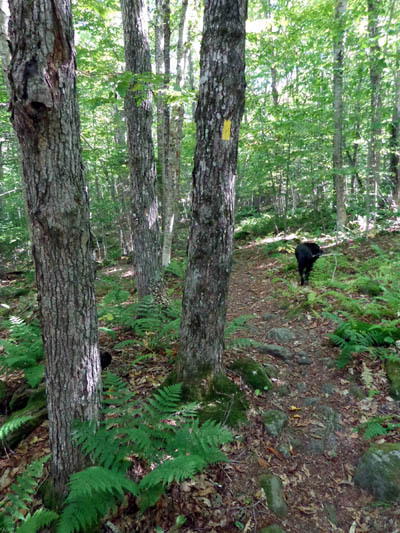 I hiked the loop with the dogs on Wednesday while Jim was doing a long bike ride from our campground, through Franconia Notch, and down to Lincoln. 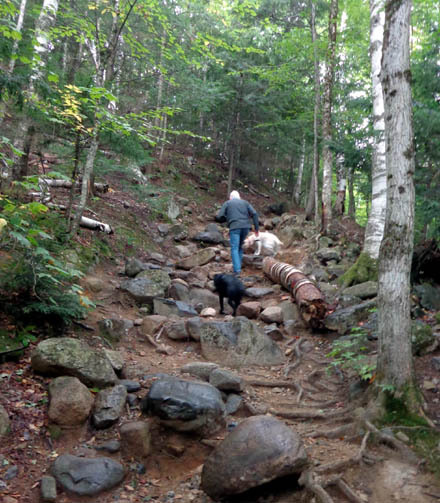 This was a tough hike for me with a rambunctious young Lab on a leash most of the time! 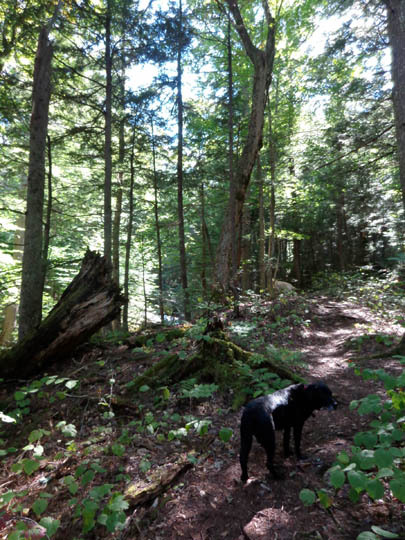 Cody was off-leash and no problem. Cody has had more experience on difficult terrain than Casey. 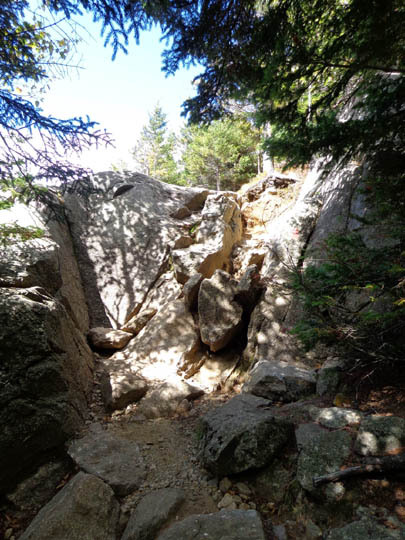 There was no way around this 10-foot rock wall, just up or down. 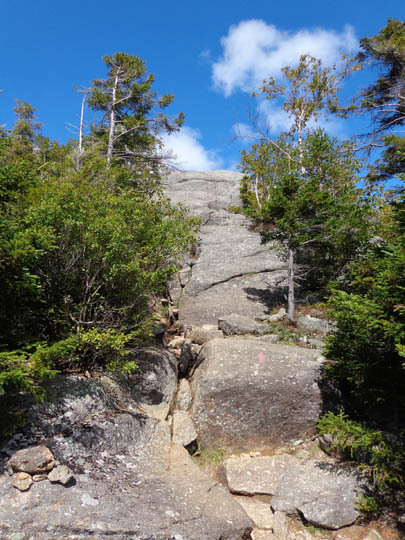 Ditto for this 20-foot slope on smoother bedrock. After we hiked Artists' Bluff I drove down to the parking area by Echo Lake, planning to take the dogs on the trail around the lake. 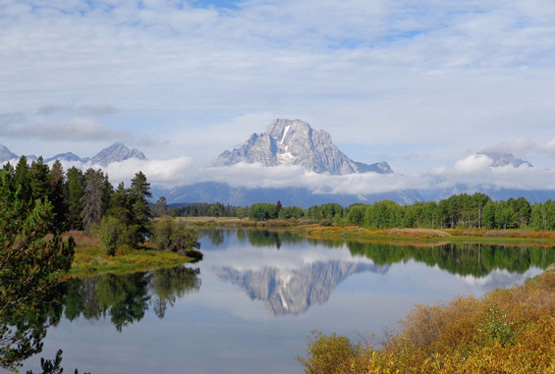 This scenic lake is popular with picnickers, swimmers, boaters, fishermen, hikers, and photographers. 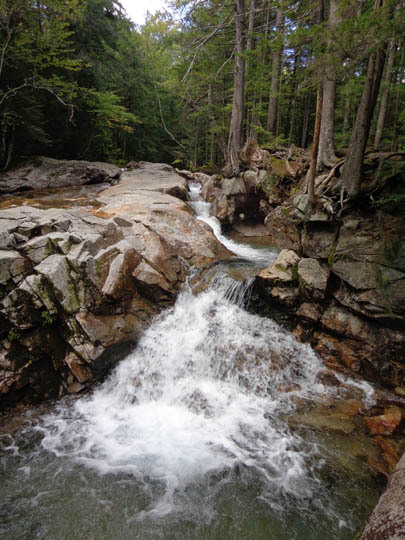 Continuing farther south through Franconia Notch State Park on my way to pick up Jim in Lincoln, I stopped for a half-hour hike at The Basin. 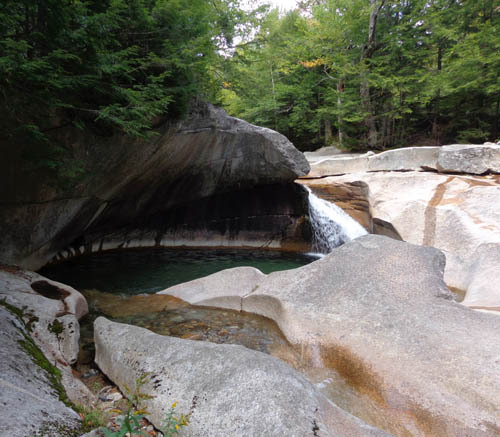 This extremely popular pool of water is located across the road from the equally-popular Flume Gorge, which I talked about in the July 26 entry. 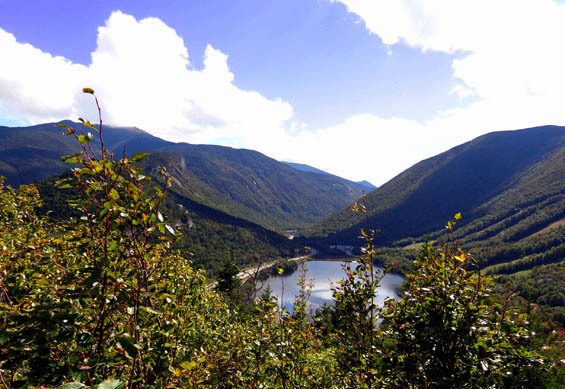 There is a fee to hike the trails in the Flume area, but you can park in a pull-off on the west side of the I-93 parkway to easily access The Basin for free. Or you can park in the main Flume parking lot and walk a little farther (it's still free to hike to the Basin from there). 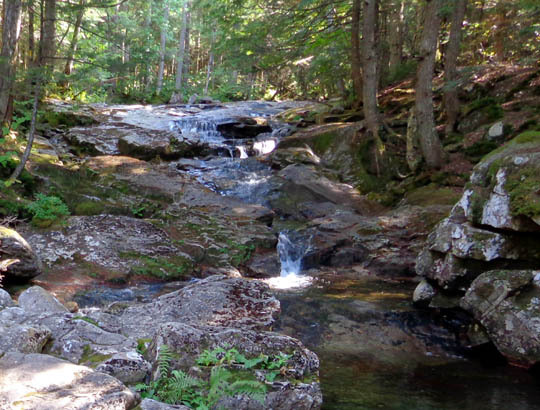 It was only about a mile total out and back to the pool but what a gorgeous hike -- and the trail is easy in this area, so most people can access it. Our buddies Eric and Lynn highly recommended we visit this historic site about 15 miles north of our campground at Twin Mountain on US 3. They like it so much they drove a lot farther than that from their home in Maine to give us a tour of the place last Sunday. John Wingate Weeks was a leading conservationist, U.S. senator, U.S. congressman, and Secretary of War under Presidents Harding and Coolidge. He built an estate on the top of Mt. Prospect, near Lancaster, NH. 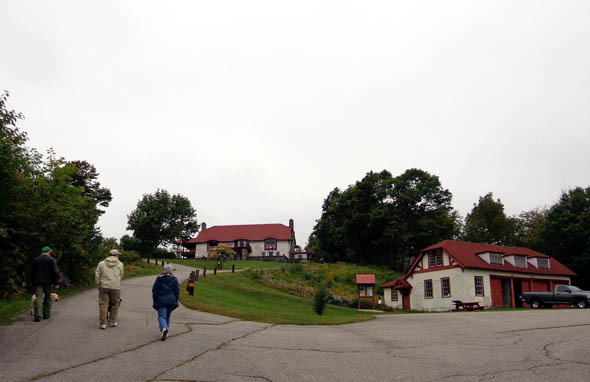 It was donated by his heirs to the state for a park in 1941. 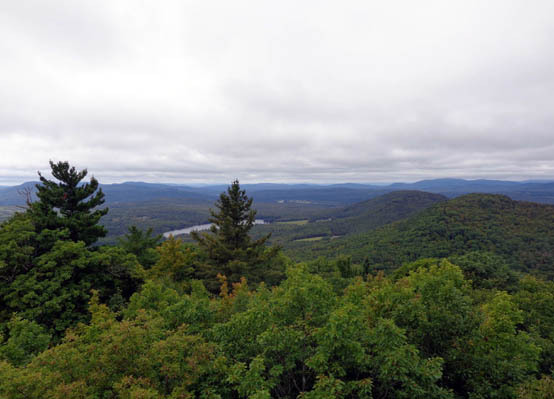 The house, lodge, fire tower, and trails around the grounds have a panoramic view of the White Mountains of NH, the Green Mountains of VT, other peaks, and the upper Connecticut River Valley. 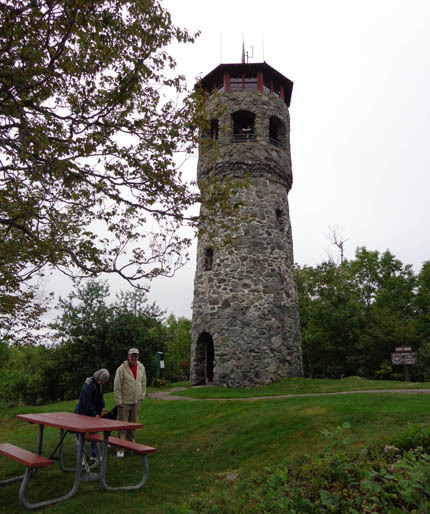 Eric, Lynn, and their dog Madison wait while Jim climbs inside the tower. My legs were a little sore from my Mt. Madison hike the previous day but the steps in the tower weren't that difficult to negotiate. It's worth the trip to the top, if you can manage it.